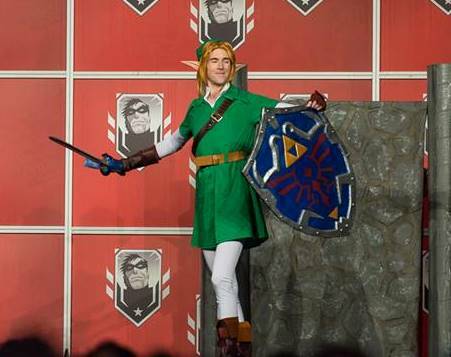 Bandit Spurs and I wanted to do a Legend of Zelda skit as a masquerade performance but we needed a Link to complete the skit. My boyfriend Corey graciously stepped in and we totally rocked it! I made the majority of the costume for him while he focused mainly on the sword. Shirt - The shirt pattern was made by taking apart an old T-shirt at the seams and lengthening the sleeves. 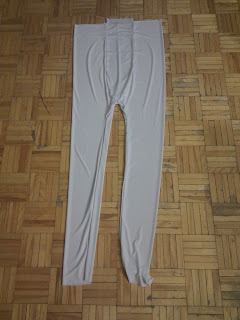 It was made from a white knit fabric and quite easy to assemble. The mandarin collar was the trickiest to make since it needed to stand up and the fabric was not very stiff. I used a very stiff interfacing inside it which caused all sorts of sewing problems but I managed to work it out. Tunic - The tunic pattern was the same pattern as the shirt except it was longer and and inserts added just below the waist in the front and back for added maneuverability. The collar was a strange shape which I had to play around with for a while. The final shape I opted for was a typical collar shape with a slightly larger rectangle added underneath. The whole tunic was underlined because the green material I had bought for it was rather thin and sheer. The final length of it reached to above Corey's knees while the sleeves were above the elbows. Belt loops were added along the waist to allow the belt to sit nicely in place. 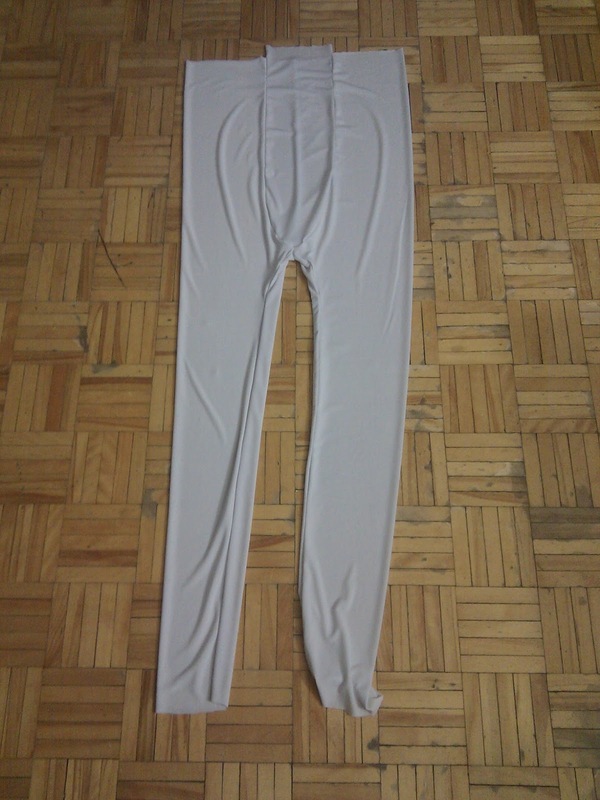 Leggings - I had to figure out how to make leggings that would be comfortable for a guy. I followed the same directions as I would for the leg portion, then added a "pouch" in the front crotch. They were made using the same white fabric as the shirt. Boot Covers - I used a brown vinyl for the main portion of the boot covers and scrap light brown leather for the top cuff. 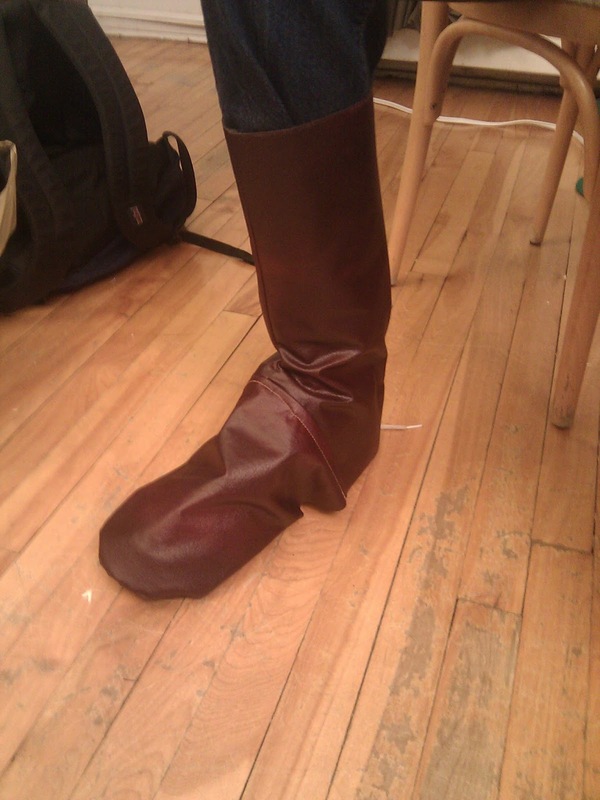 I took a couple of measurements around his shoe, then drafted a pattern from them, giving room for errors. The covers were designed to go over his shoes and to be held down with elastics. A zipper was inserted into the backs of each. Scrap brown leather was sewn to the boot covers underneath the cuff and adorned with a buckle. Gloves - As with all my gloves, I had to form a pattern. I made Corey wear a latex glove which then I taped up and cut him out of. 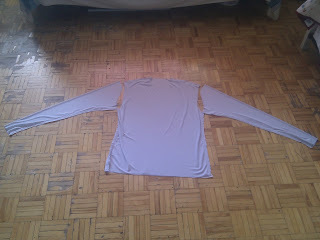 I tweaked the pattern to include seam allowances and ease then went on to making mock ups. The real gloves were made from brown leather and all hand sewn. 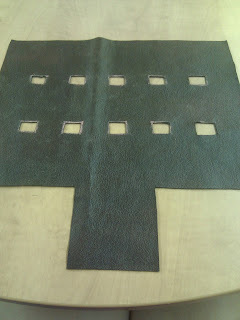 The finger tips were cut off at to reveal the fingers and the edges were finished with a blanket stitch. Bracers - The shape of the bracers was really quite simple; a long rectangle with a little square piece in the middle on top. 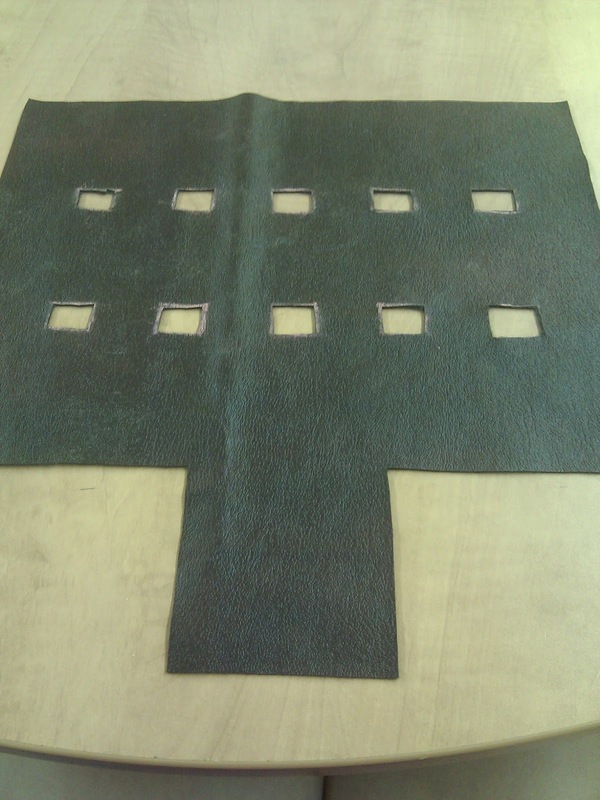 Little square holes were cut out of the rectangular part to allow the glove underneath to peak through. They were made of brown vinyl and only comprised of one seam. 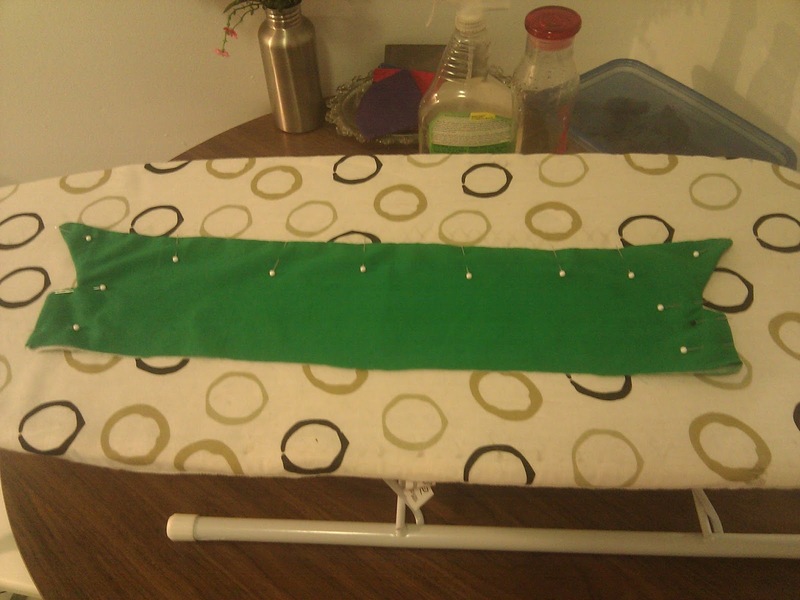 I didn't bother finishing the edges of the holes but the longer exposed edges were turned under and hemmed. Wig - I used the Jaguar wig in ginger blonde from Arda wigs as the base. The bangs and back of the wig were trimmed to get the right cut of Link's hair. The bangs were further styled with heat, teasing the hair at the base and hairspray to get the winged bang look that OOT Link has. Hat - Link's hat was made using the same green fabric as the tunic. It was comprised of the triangle piece and the cuff. The triangle piece was sewn to create a cone shape, which was then sewn to the cuff. The cuff was lined to give it stability. 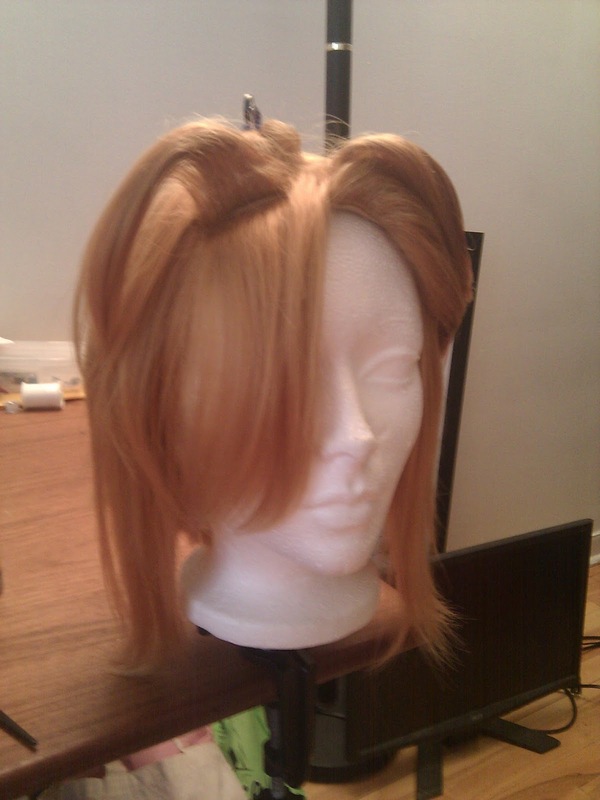 It was made to fit over the wig while Corey was wearing it and it stays in place with some bobby pins and clips. Belts - Link has two belts, on that carries the sword and shield on his back, the other to wrap around his waist. I bought the one that wrapped around his waist but made the cross belt. I took a long strip of vinyl, folded over the edges and hemmed them. The pattern on the belt was made by sewing lines at intervals along the length of the belt. The buckle was attached to the belt through an eyelet and the holes were made sturdy with even more eyelets. 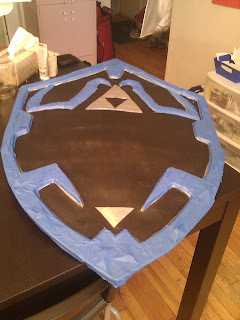 Props - My main prop focus was the shield while Corey worked on the sword. I helped him come up with the pattern for it, then cut out the shapes, carved some of them and glued them together. The shield is made of cardboard, craft foam and pieces of EVA foam, with Worbla covering it. The Worbla was primed using a spray filler, then spray painted black. Most of the colours were spray painted on, the silver being the first, then the blue background. When we were spraying one colour, only the surfaces that were supposed to be that colour were exposed, the rest were covered by painter's tape. I painted the details on using a stencil and normal acrylic paint. We sealed the entire thing with some clear acrylic sealer then added the vinyl backing on with lots of patience and hot glue!